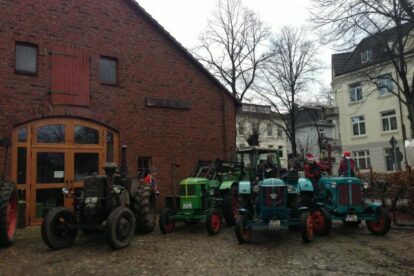 A part of my extended family still has an old barnyard in Eidelstedt, a part of the city to the west. Though it us usually closed to the public, once a year you can check out their old tractors. That would be on Christmas Eve around noon. But of course the barnyard’s outside is always visible. The same goes for their fields nearby the “Niendorfer Gehege” (check out the article). During winter it is just relaxing to have a wide open space to look at – and we do so, when we go on that tractor trip as the fields are part of the destination – but during summer it is a whole other story. I highly recommend going checking the fields during the summer as they offer seasonal gardening for townspeople there. And the townspeople don’t usually just have food plants but also flowers. To check it out go on their website with a map under “Saisongarten/Anfahrt” and/or look at the article about “Niendorfer Gehege” as the fields are just next to that forest. And if you wanna attend something very special on Christmas Eve, gather with us and the old tractors, and participate as a bystander at our round trip which starts around noon. To be on one of the over 50 year old tractors is a private thing but you can check them out anyways as most people do who are familiar with this tradition for some years now.